For nine GOP Presidential debates, Florida Senator Marco Rubio tried to rise above the fray, letting 12 other candidates take on rutheless counter-puncher Donald Trump. Rubio calmly watched each of these contenders - including his former mentor, Jeb Bush, armed with over a $130 million in campaign and super PAC cash - get TKO'd as the irascible real estate tycoon dispatched each in turn with a vicious, deeply personal ferocity never before seen on a Presidential debate stage. On Thursday night in Houston, Texas, however, in the last debate before the delegate-rich Super Tuesday primaries of March 1, Marco Rubio came out of his corner like a man possessed. It was the political equivalent of boxer Muhammad Ali dramatically upsetting George Foreman in the Rumble in the Jungle. 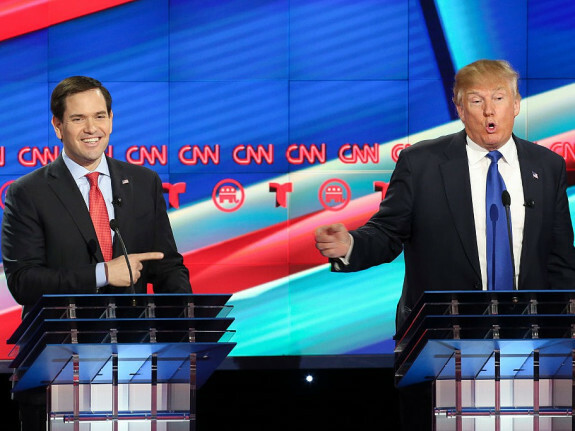 As Rubio hammered Trump on hiring illegal Polish immigrants, the fraudulent Trump University, and then, in the night's coup de grace, the Donald's lack of health care policy specifics, it seemed as if Rubio had been deliberately playing rope-a-dope all along. Right before our stunned eyes, the sweaty, robotic, baby-faced "bubble boy" transformed into a cocky killer, as he landed blow after blow against the presumptive nominee. At one point, as the flummoxed and flailing Trump struggled to come up with any health care plan specifics besides allowing insurers to compete across state lines, Rubio openly taunted, and then devilishly imitated, the real estate blowhard, who fell right into the same repetitive trap that Rubio himself had fallen into against a similar Chris Christie barrage a few debates back. Undaunted, Trump went in for his customary ad hominem takeout: "Talk about repeating. I watched him repeat himself five times four weeks ago." Rubio was having none of it. "I saw you repeat yourself five times five seconds ago," he parried, while openly smiling at Trump's sudden reversal of fortune. 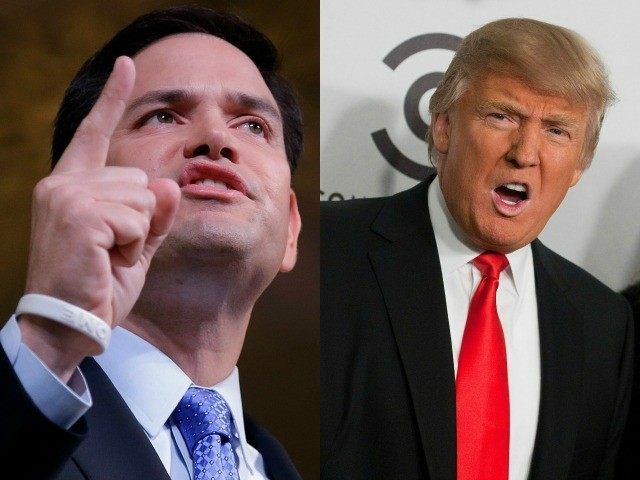 Though Trump tried to cushion the blow by randomly calling Rubio a "choke artist" throughout the evening, it was clear to all that Trump had stumbled badly, and that Rubio, a former star high school cornerback, had put a "stick" on the billionaire and come out the winner of the night's signature exchange. However, some of Rubio's attacks might not hold up. For example, there's still some doubt whether Trump had full knowledge that a Trump Tower contractor had hired illegal Polish aliens. Moreover, it was a little rich for Rubio to attack Trump University when Rubio himself took donations from, and made legal life easy for one of the largest scammers, Corinthian Colleges, in for-profit college history. I know of what I speak, since I wrote about Corinthian and for-profits for four years as the Forbes education columnist. Though Rubio did not effectively use other chances to inflict hurt on Trump during the rest of Thursday night's debate (other exchanges ended up in noisy, cross-talking tie-ups with no real winners and losers), the damage to brand Trump was done. Though Trump spun the evening as an enjoyable triumph (he's figured out that half the battle in nationally televised debates is in how you spin it), those watching live at the University of Houston, and at home on CNN, knew that Rubio had struck a nerve, and that some of these attacks will have staying power now and, should Trump be the GOP standard-bearer, well into the general election. Meanwhile, Texas Senator Ted Cruz struggled to find similar mojo against the wily frontrunner. His stiff strategy of endlessly proclaiming that the flip-flopping, constantly evolving Trump is not a true "rock rib" conservative has failed to gain sufficient traction in a year when the GOP electorate - fed up with politics, politicians, and political inaction - is not rewarding conservative, if homophobic, fealty. Takeaway? With only a few days to go before Super Tuesday, Marco Rubio at last found a way to damage the New York real estate billionaire, whose Palin-like refusal to bone up on policy details finally cost him. However, like New Jersey Governor Chris Christie (who just endorsed Trump for President), might Rubio have also taken himself out in the process? Moreover, given the unwavering nature of Trump's core support, are these fulsome attacks on the GOP frontrunner too little too late? As nervous establishment donors line up behind the suddenly resurgent Florida Senator, there's a whole lot banking on the hope that the answer to both questions is a resounding and unmediated no. James Marshall Crotty is the peripatetic publisher of Monk: The Mobile Magazine, author of How to Talk American (Houghton Mifflin), and director of the urban debate documentary Crotty's Kids. He writes about the intersection of travel, culture, and politics. To learn more, please go to www.jamescrotty.com.